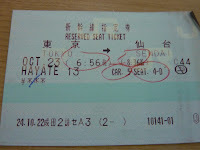 We awoke early the next morning, had a shower and got ready for our train north. We ended up running a bit late so I could not get any breakfast and without having anything last night except the admittedly substantial amount I ate on the plane, I was fairly hungry. Luckily Kate managed to obtain a sushi bento box. It had 5 large diameter but short sushi rolls with mushrooms as the filling. I was lucky enough acquire two! Once at Sendai we exited the station and looked for our hotel (Comfort Inn). It was a bit rainy outside but not too bad; it didn’t need an umbrella. Although we did buy one each at the station. They came in handy later. We found the hotel nearby with the help of my phone and checked in. It was a bit unusual in that reception was on the second floor though nice as it can be a bit awkward walking past reception all the time. Upon asking to store our luggage we were finally free for two days! Bliss! Now it was time to make our way back to the station and on to Matsushima! Matsushima is known as one of japans three most scenic views and is famous for its myriad pine tree covered islands. The name is actually a direct reference to the islands: 松島 = matsu+shima = pine tree + island. 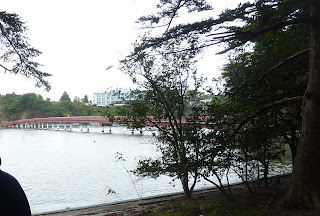 We planned to get off the train at nearby Hon-Shiogama and ride a cruise boat over to the main part of Matsushima. The boat would take us close to many of the famous islands! 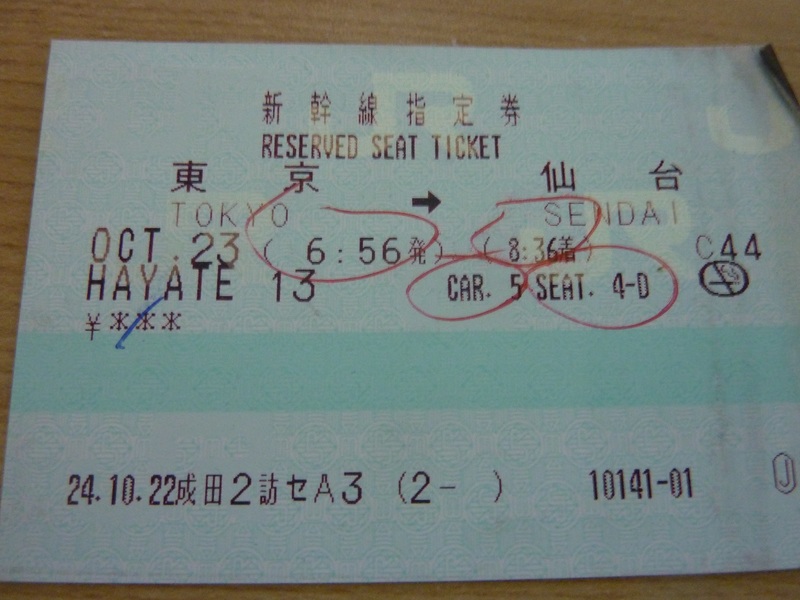 We used the rail pass as it was a JR line (Senseki Line). On our way to the ferry terminal from the station we passed by a shopping centre, stopped inside, and found within our first normal sized super market! We had not encountered one on our previous trip to japan so we were quite excited to find this one. I'm not sure if there's an EVE B or not. I spent some time trying to find some pain medication with ibuprofen in it and successfully found a medication called EVE A. One major down side was that it also contained a large amount of caffeine. So, not so good if you want to take it before bedtime. Or any time after 10am for me with my sleeping issues. I also bought 9 Dango on 3 sticks for 98 yen: Pink, White and Brown. I didn’t like them though unfortunately. Too sticky. Kate picked up some treats from the bakery and we made our way to the ferry terminal. We had just missed the last boat so we had a half an hour wait until the next one. There were not very many people around although this was easily attributable to the rainy weather. When the did boat arrive though a massive amount of people got off! It made me feel like we were doing the cruise the wrong way as there were only five of us waiting to board. It looked like they were part of a domestic tour group(s) as some of them were wearing uniforms and waving flags that everyone was following. This is quite a common sight in the popular Japanese tourist spots, I personally think it’s a bit strange to go on tour of your own country. It beats getting lost though I guess. All five of us had only bought 3rd class tickets which meant were could not go up to the higher decks. There was actually more crew than passengers for this trip. There was us, an older couple, and another guy who was by himself. After boarding I got asked if I understood Japanese by one of the staff members and said "Yes, just a little", he then asked if we'd like English and I said yes to that too. Turned out that they had an English track for the voice over commentary. It was a bit embarrassing having it on just for our benefit. I did notice that a fair amount of stuff left out of the English translation as compared to the Japanese audio. I wondered if that was because they had updated the Japanese track since the English one was created, or maybe it was to save time. The pretty islands finally got us to fire up the cameras and we started taking lots of photos of the islands and each other. This poor little island is almost completely eroded. I noticed that many of the islands had a fair amount of sedimentary layers displayed and I was quite interested in the geology of Matsushima bay while we were there. It turns out that the deposits making up the islands belong to the Miocene Matsushimawan Group. The rocks are therefore between 5 million and 23 million years old. Interestingly, the marine clay sediments below the islands are from the Holocene. This is a period of time beginning about 12,000 years ago and continuing until now. So basically the rocks below are younger than the ones above! Something interesting must have happened to cause this. It turns out that this was caused by a "Mega Landsline" about 6,000 years ago during which a 10km long chunk of Matsushima slid horizontally about 5km into the ocean. The landslide was likely caused by an earthquake and would probably have created a "Mega Tsunami". The islands are the remains of this massive event and been eroding ever since they slid into the ocean. The older man (in a couple) started talking to us in English for a bit during the boat ride. I can't remember exactly what he or we said though. I do remember taking a photo for them as well. For some reason about half way through the other man (who was by himself) stopped looking and photographing the islands and spent the rest of the trip chatting the staff member who was looking after the counter on the boat (I think it was a food counter). After arriving in Matsushima and getting off the boat we headed for the most distant attraction, Fukuura Island (福浦島 - fukuurajima), with the intention of working our way back towards the station. 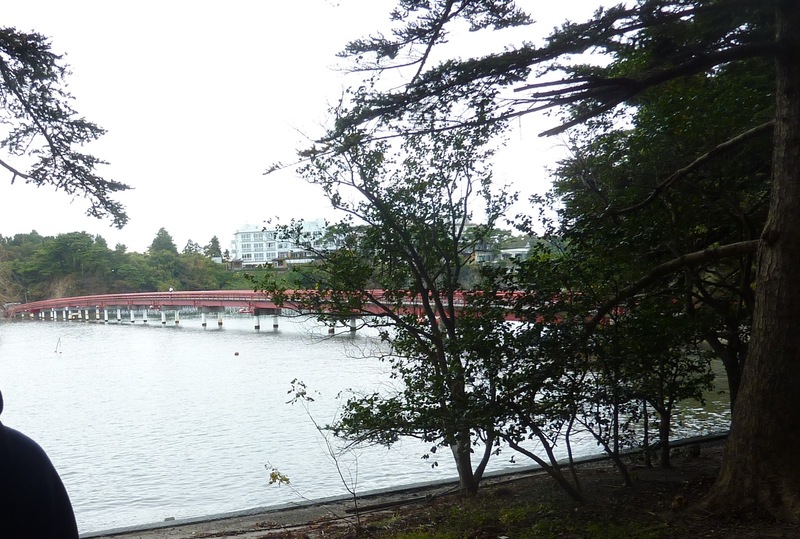 Fukuura island is a pine covered island connected to the mainland by a 250 meter long red bridge. In order to acess the bridge you had to go into a small building where you could buy a ticket from a vending machine. It costs 200 yen to cross over to the island. You don't have to pay to come back though! We spent about 40 minutes walking around the island and came across some pink, tall pretty flowers. While we were admiring them what looked to be a large moth or wasp started flying around the flowers, after a closer inspection it looked to be a humming bird. There's no humming birds in Japan though apparently. Further research has revealed that it was likely a Hummingbrid Moth. No wonder I was mistaken! It was still pretty cool though. You can see the flowers, can you find the hummingbird moth? Here's a close up view of it feeding. Doesn't look very mothy. It started raining shortly after we found the flowers and fearing a downpour we retreated back to the mainland. While we waited for it to stop raining we had a look in some of the shops along the way to Godaido (五大堂). 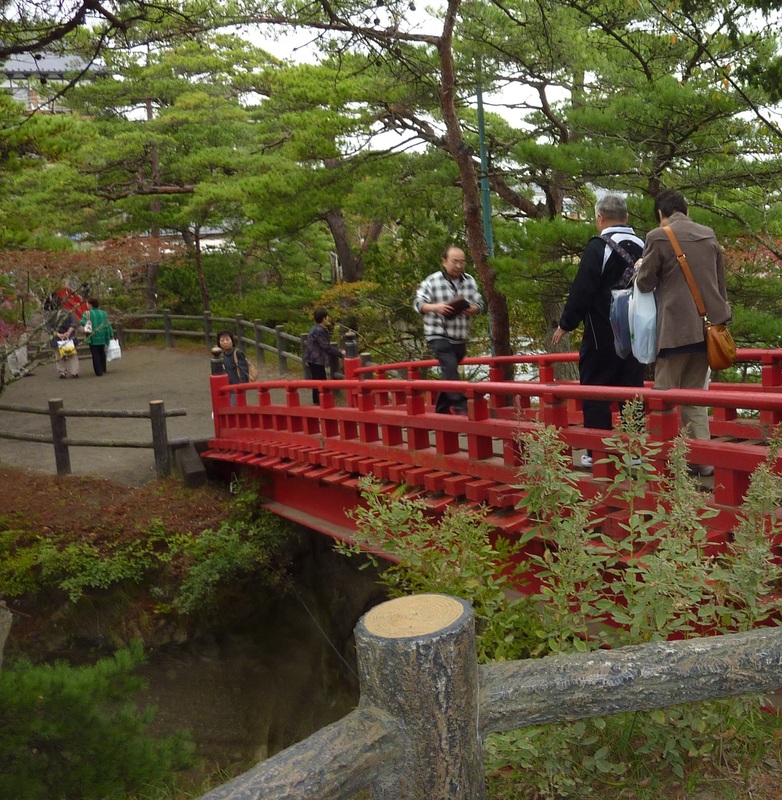 The most exciting part of visiting Godaido was walking across the red bridges to get to the temple hall. They had very low railings on either side (about knee height) and the drop to the shallow ocean or rocks was about 4 meters from memory. It was OK if you walked across normally but I wondered if anyone had ever fallen. The horizontal planks making up the floor of the bridge where spaced such that there were many large gaps where you could look down and see the water. It went: Plank, Gap, Plank, Gap etc. On both the left and right hand sides of the bridge there was a path that covered up the bridge so you could just walk along that so you wouldn't risk falling through. The temple hall was built in 807 but reconstructed in 1604. It's amazing that even reconstructions are so much older than any building in Australia. 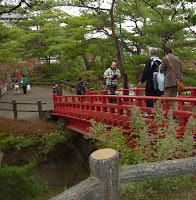 After visiting Godaido we went to Zuiganji which is a famous Zen temple. The main hall was undergoing renovations so we could not enter it but we were able to go into another room that had many of the artifacts from the main hall. The security guard at the entrance was quite chatty! It was a good chance to practice japanese, he asked the usual questions, like where we were from, how long we had been together, how long we were going to be visiting and where I learnt Japanese. He asked if I knew the German person who was going around. I said I had no idea. I didn't even know he was German. This was in reference to a person looking around the temple with an entourage of about 10 people including a translator, a monk from the temple, a photographer and what looked to be a representative from JR East. I saw them at a few of the other attractions in the area. No idea how rich they were to get all that attention. Once inside someone else wanted to explain to us what was going on! He explained the significance of the different statues and that the main hall was undergoing restoration and that the items were not usually displayed together like this. He spoke in fairly basic Japanese for me so it was pretty easy to understand and at the end he asked me to explain to Kate in English what he said. After Zuiganji we went to Entsuin and looked around the gardens there. It was funny how on the map they gave us "Moss" was written in at various locations. The actual moss garden had a lot of mosses on the map but the rest of the garden had it written in sporadically as well. We saw the mausoleum, the maple garden and the heart shaped pond while we were there. As well as the rock garden. After the gardens we made our way back to the station and caught the next train back to Sendai. Once back in Sendai we checked into the hotel, took our luggage up to our room and had a quick rest. We went back out later to have a look at the shopping streets (including the covered Ichibanchou) and hunt for food. We visited a pet store that had really cute and really tiny cats and dogs. They were incredibly cute. I can't remember what we had for dinner this day but I do remember that we had a fair amount of trouble deciding and finding something to eat. A major issue we have is that I cannot eat onion, shallot, chives or leek. They make me pretty sick and are unfortunately in almost everything. Shallot comes on top of a lot of things but "Negi Nashi de" (without shallot) usually solves that. The biggest problem is onion power and sauces that contain little bits of onion. We were looking for tenpura soba but I think we ended up getting just meat soba. It was a small place with standing up room only. It was one of those places where you ordered by pressing the button of your choice on a vending machine and taking the ticket it spits out to the chef. When you give your ticket to the chef you often have to choose between Soba & Udon (by saying which one you want). Sometimes you have to pick if you want hot or cold noodles as well (Atatakai is warm or tsumetai is cold). There's often pictures of the food outside but just words on the machine inside. There's usually heaps and heaps of buttons so it can be a bit confusing at first. One tip I remember from last time is if you can't remember the words from outside one trick we realized last time was you could just remember the price of the dish as the numbers are much easier to spot. Although you'd probably want to double check the words or check to see there's nothing else for that price. While eating I watched some Japanese people ordering and was revealed to see they they seemed just as flustered as us. One person stood at the vending machine for ages, and another forgot to say if he wanted cold or hot noodles. One thing to remember is that many Japanese restaurants need you to return your bowl and tray yourself. Don't just leave it behind! Usually there's an area with a few shelves what you can leave your dishes. Look out for this Kanji: 返 (It means return). After dinner we had a brief look in UNIQLO and I think I remember a 100 yen shop as well. After that it was time to return back to the hotel and look forward to visiting Yamadera the next day!